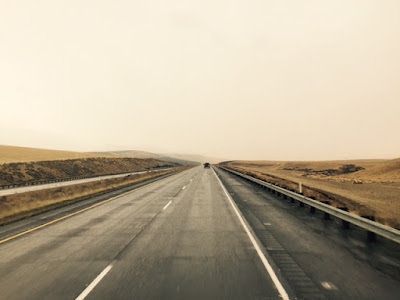 Today's post is a picture heavy travelogue from Sun Valley Church in Florence, Montana to Amazing Grace in Atwater, California. It started out cold with a wintry mix of precipitation, morphed into rain for most of the trip with occasional brief burst of sunshine. The Detroit 60 series pushed the BoggsMobile 1257 miles and brought us safely along our journey. You may remember the BoggsMobile was parallel parked at Sun Valley Church with about 34 1/2 inches of total space in front and back. I figured it might require several times back and forth to clear the fence in back and the shed in front. I should have known with Kelly Jo behind the wheel, it was going to be a breeze! 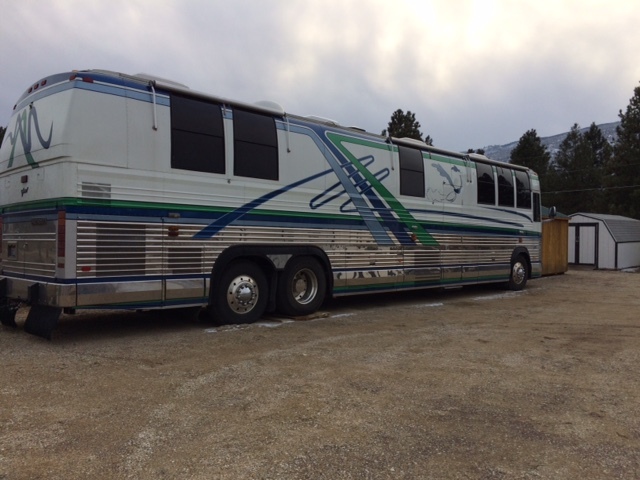 Here is the bus Wednesday afternoon right before KJ moved it. She backed up one time with the wheels cut hard and then pulled forward clearing the shed by a good margin. Here she is about half way turned around. She backed up toward the shed on the right and then was straight. 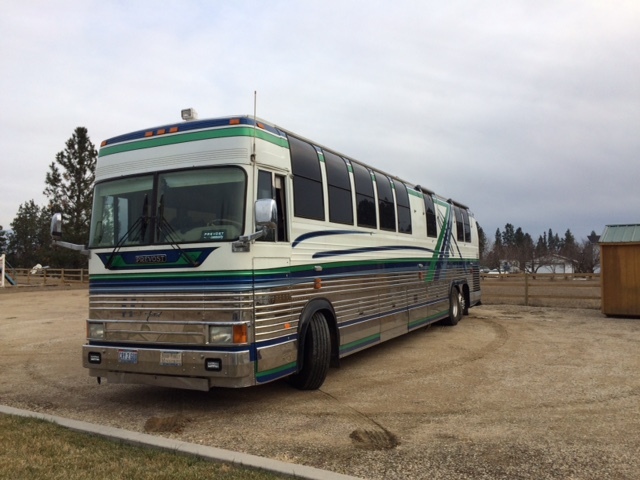 We hooked up the Green Machine and left it all right there during church Wednesday night. After hugs and love all around we hit the road about 9:30 Mountain time Wednesday night. We do not like to drive at night out in the west because we miss so much beautiful scenery. The drive from Missoula to Spokane is awesome and it was even better with several inches of snow on the steep mountains and the trees. We needed to put some miles behind us so we only caught glimpses of the beauty as we carefully made our way through darkness, rain, a few snow flurries and small patches of snow covered roads. Those mountains are slow going anyway for the bus, but we really enjoyed the drive. We intended to stop for the night at a one of two rest areas near the Idaho/Washington line. The first one had no place left to park and the second was closed down. We finally stopped at 1:15 AM Pacific time about 50 miles passed Spokane at a rest area near Sprague, Washington after 251 miles. I left the BoggsMobile running because it was very cold and we were only going to sleep 4-5 hours and then hit the road. After sleeping 2 hours the high idle on the bus quit. When idling I put it on high idle with is about 1000 RPMs as opposed to low idle which is 500-700 RPMs. It is not supposed to idle for long periods on low idle. When the high idle is turned off, it changes the sound of the engine and that woke us up. Since I did not know why the high idle quit functioning and could not fix it, that was the end of the night for me. I contacted the best bus people I know and hit the road after daylight. It was a day filled with rain. We even drove through a pretty intense hail storm that thankfully only last seconds. It was like a hail micro-burst. 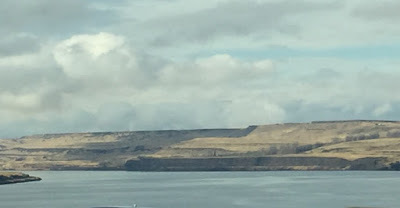 We were hoping for a little sunshine as we drove west on I-84 through the Columbia River gorge and that is exactly what we got. Excellent! 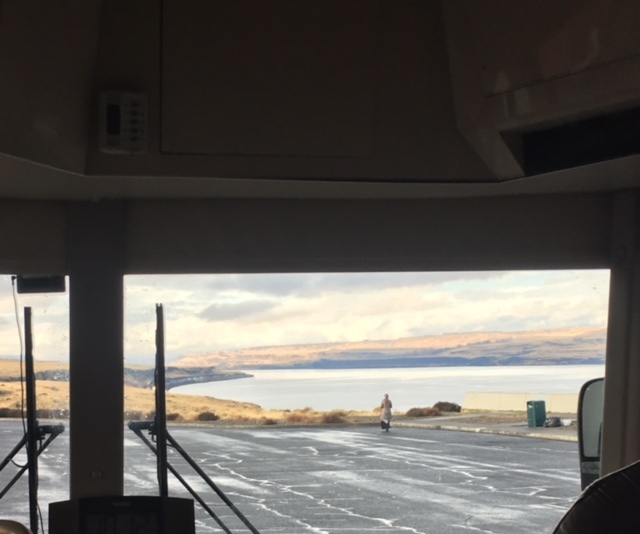 Can you imagine Lewis and Clark and all of their men walking on I-84 in late September 1805 and all they see is flat ground ahead? Then suddenly the flat ground gives way to a gorgeous and expansive gorge! I wonder what they thought? These iPhone pictures can not capture the grandeur of the Columbia River gorge though the three of us tried dozens and dozens of times. Kelly Jo and I drove this the first time in the BoggsMobile in August 2010 but Odie was not with us. I wanted her to see it first hand. We drove the full length of the gorge in a few hours, stopping here and there to admire the beauty. It took Lewis and Clark weeks to navigate the distance in dugout canoes. The rapids were bigger than anything they had seen the whole distance from St. Louis and the constant rain and wind pinned them down for days at a time. The gorge is so big and the journey had taken so long that Clark noted in his journal that the "Ocian" was in view on November 7th. In reality he was looking at Baker Bay a ten mile wide expanse of the Columbia River. They did not reach the ocean for 11 more days! We would like to spend a few days there some time! Wow! Odie's pictures from a little farther back in the bus. Then it was right back to the rain and wind the rest of the day. We turned south on I-5 at Portland. Traffic was horrendous all the way south of Eugene, Oregon. With the wind, rain and nutzoid drivers, my muscles were wrapped up tighter than a banjo string. Later we stopped for fuel then drove four miles to a rest area near Oakland, Oregon for a grand total of 474 miles Thursday. Friday we drove through awesome mountain passes in southern Oregon and northern California. These next several pictures are in the exact order they were taken so you can see for yourself it was rain one hour, flashes of brilliant sunshine and then back to rain! As we were driving into California we realized we had never been on I-5 in that part of northern California. We have always taken the coastal road. We drove all the way down the Oregon coast and California coast pulling the fifth wheel in 2005. We pulled the trailer all the way to Half Moon Bay south of San Francisco. The trip through in 2010 we cut over from southern Oregon to the coast and drove the coast a few hundred miles in the bus. 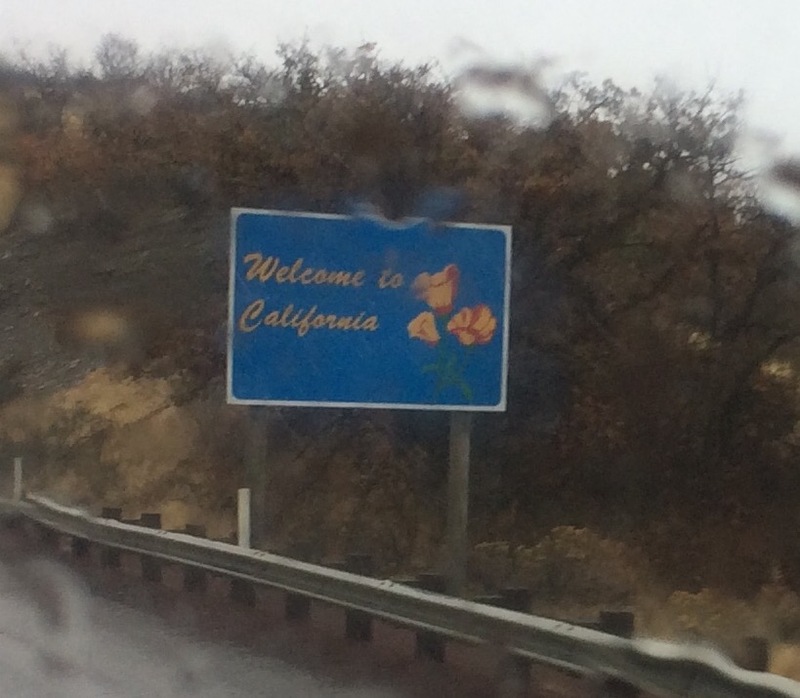 We had never seen north central California and it is a beautiful sight to behold! There are a few pictures below. We ate lunch at a rest area some where in northern California and I tried diagnosing the high idle problem with tips from Jeff Rowe and Ben Isaacs. We thought it might be one of these two sensors below but my attempts at testing them proved nothing yet. Kelly Jo created a clever temporary solution. It is perfect! Now back to more pictures from California. We pulled into Amazing Grace Holiness Tabernacle quite a while after dark Friday evening after 532 miles on the road that day. The total was 1257 miles and we thank God for keeping us safe every mile of the way. Even with the cold, wind, rain and hail, it was an absolutely gorgeous drive! We are content not to drive a long, long ways for a few weeks!